Nokia N8 is running on the latest Symbian^3 OS together with its other armada, Nokia E7, C7 and C6-01, and also it the best entertainment smartphone right now to offer the a sleek and exterior design. With 3.5″ AMOLED capacitive touch screen on gorilla glass and anodized aluminum casing that comes from different colours are definitely the few salivating features. 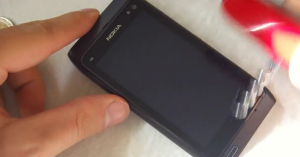 Check out the Nokia N8 preview here. Expanding the details of the gorilla glass, it’s a top layered screen to withstand scratches from your typical daily use. But the question is if it is really tough as gorilla? Well, check out the stress test from pestaola using the Swiss Army knife. I had a E66 till now and the central button shows pity corrosion…… mmmh…. Bullsit, official video from nokia. I don’t know if you’re deaf or something, but I can clearly hear the knife hit the screen. So!!. Is this a Swiss Army add or just how to be an stupid carrying and using your handset? it’s test on the screen…did you ever put ur phone on ur pocket with coins on it? Sure, I know that! I was just kidding because i guess nobody will attempt to scratch his phone with a knife or any other tool. He’s going a little bit too easy on it I think. When will it start to show scratches? You have to dig in a bit, cut cut cut, use a breadknife. Put on some mountain climbing shoes and do the moon walk on it. Put it on the asfalt face down and run over it with a SUV. If it survives that I’m impressed. Then you’d have to go even deeper and take out the blender and the lawmover. Something’s gotta take down that gorilla glass. Does it come from outer space? When did exactly aliens delivery this material to Nokia? Well I’m a little bit impressed. Gonna show this to my wife now, she’s a born cell-phone abuser. n8 is cooooool …… but still peopke dont know it price. what is its price? my nokia n8 has got scratches.. it slipped through my hands and fell to the floor..this ai’nt a joke. this phone s not scrath free.